This tie out cable with shock-absorbing spring has a weatherproof plastic coat. Not every dog owner has a kennel or wants to built a meter-high fence around his property. This tie out cable offers an optimal solution so that the dog has its space to run about in. It is more secure and stronger than most kinds of yard chains and the shock-absorbing spring protects your dog from injuries. The plastic coat makes the tie out cable stiff which protects the dog from strangulate itself. Moreover, the plastic coat prevents corrosion and it makes it easy to clean. 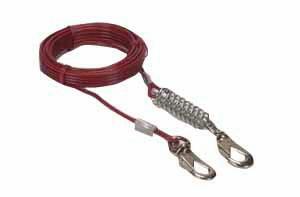 Nevertheless, you should always be aware of that the tie out cable only is a short-termed solution. It will not replace walking the dog. The tie out cable is not for permanent use. 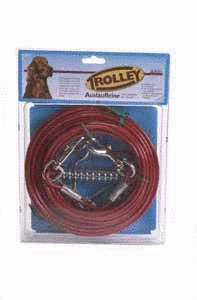 The Trolley offers your dog an ideal space to run about in. It is more secure and stronger than other tie our cables or yard chains. It has a length of 15 meters and due to the plastic coat it is weatherproof and easy to clean. With shock-absorbing spring. Easy to install at trees and buildings.